Through sheer hard work and determination, Lopez was soon back at school and on to his normal, rigorous schedule. 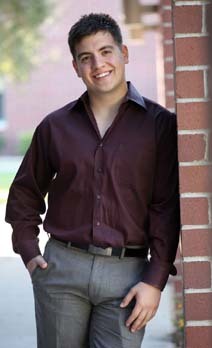 When he graduated from high school, he also earned his Associate of Science in Biology from STC through the college’s Dual Enrollment Medical Science Academy. He went on to take additional courses at the college to also earn an Associate of Science in Chemistry. All this was done with the ultimate goal of becoming a doctor - a goal that comes from not only his own experiences as a patient, but those of his mother. “Growing up, I learned the value of life at a young age,” Lopez said. “My mother battled cancer on and off for 13 years. And through it all, she never gave up and was always working to better herself and she even went back to school when she was sick, just to earn a living to support us. She set the precedence for me to always work hard. He went on to enroll at Texas A&M University at College Station, where he confronted the life of a small town boy at a big university. But the college-knowledge he gained at STC served him well. At TAMU, Lopez went on to become the first Rio Grande Valley native in the school’s history to serve as the president for the American Medical Students Association. He was also selected to serve as the National Premedical Director for the American Medical Student Association Region 9, overseeing 19 Chapters in the states of Texas and Oklahoma. He was just one of 80 students from across the nation selected by The University of Washington School of Medicine for a summer medical internship program. He spent six weeks with a mentor at a medical school in Seattle, Washington, taking medical school courses and observing in emergency and operating rooms. Lopez will graduate from TAMU with his Bachelor of Science in Bio-Medical Science in May 2011 and has already been accepted into The University of Texas Health Science Center at San Antonio School of Medicine. He begins his studies to become a doctor in summer 2011.